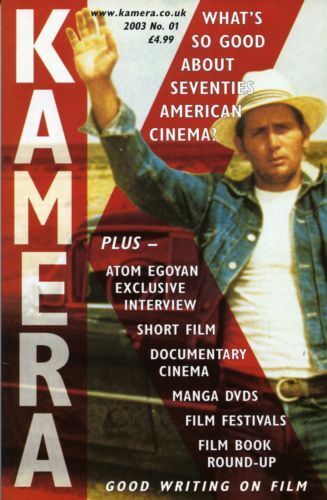 - kamera.co.uk goes off-line in order to cover world cinema. - Each issue has a center theme and includes interviews, articles on filmmakers and film festivals, reviews of films, books and DVDs, plus short films, music and more. - Publisher: Pocket Essentials, 96 pages, bi-monthly. The Horror Issue The neglected British horror. Reviews of The Last House on the Left and The Crazies on DVD, and books on the slasher film and George A Romero. Exclusive interviews with John Sayles (on his new film, Casa de los Babys), Claire Denis and 'Africa's next big thing' Abderrahmane Sissako on his film, Waiting for Happiness. Interview with Diane Johnson, co-writer with Stanley Kubrick of the screenplay to The Shining. Also columns devoted to film music, short films and the legendary film critic Pauline Kael.